(Newser) – Will she resign? That's about the only suspense left in Brazil on Thursday after the Senate voted to proceed with an impeachment trial against President Dilma Rousseff. The move means that Rousseff will be suspended from office while a trial that could last six months gets under way, reports the AP. But given the lopsided vote to proceed with the trial, 55-22, Rousseff stands little chance of prevailing in the end, reports the New York Times. She's accused of improperly borrowing from state banks—not to enrich herself personally, but to cover up budget shortfalls to improve her re-election prospects in about two years. Hear it from a Brazilian. 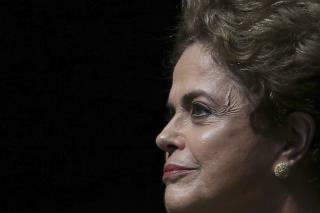 http://www.counterpunch.org/2016/03/08/the-brazilian-earthquake/ She is a scapegoat. In a neo-roman world like Brazil, this is the least of their problems! A nations economy is never safe when a liberal is in charge.